Tentazioni was an Italian restaurant in Bermondsey, near Shad Thames. It moved to Notting Hill in July 2016. 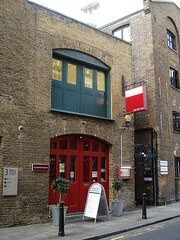 Excellent Italian restaurant in Bermondsey, near Shad Thames. Situated in one of the many refurbished warehouse buildings along this stretch of wharf on the far side of Tower Bridge, Tentazioni has chosen a deep red colour scheme (with some rather egregious spattered red paintings), offset by tasteful white leather chairs in a space which somewhat effaces the history of the area. However, it's in the food that it really stands out. They offer a £45 seven-course tasting menu (degustazione, £65 with matching wines), as well as an excellent value £12/£15 set lunch menu (depending on whether you have two or three courses, including a glass of wine). The website suggests £40 as the average price, and this turned out to be almost exactly the amount Ewan and his friend each spent, when ordering from the a la carte menu. Mains are fairly solid choices, with plenty of depth in fish dishes. Ewan's risotto ai funghi porcini e tartufo Tentazioni (risotto with porcini mushrooms and Tentazioni's truffle, £15) was rich and creamy without being overly so, with plenty of taste to it. My friend's sea bass with calamari (£17) was also deemed excellent. Starters were even stronger, with a fantastic ravioli di zucca arrostita e mostardo di frutta serviti con fonduta al parmigiano, balsamico invecchiato e salvia fritta (hand-made pumpkin and fruit mustard ravioli served with parmesan fondue, aged balsamic vinegar and fried sage leaf, £10), each of the five raviolo packed with flavour and cheesy goodness. Perhaps a little surpisingly given that they were only £2 each (special price if you've already eaten two courses), it was the desserts which were the highlight. Neither myself nor my friend are connoisseurs of the dessert, but the ones here were beautifully presented and tasted exquisite. Familiar stand-by tiramisu (£7) was served in a thin lattice pastry 'basket' with fresh fruit, while my friend's mousse di castagna servita con salsa alla grappa e marron glace (chestnut mousse with meringues, grappa sauce and marron glace, £7) was highly praised. Ewan returned in April 2010 to try the tasting menu, which was fairly good. The highlight of the fish courses was an opening course of red mullet in a well-flavoured lobster and saffron soup (though an accompanying 'Neapolitan fried pasta' was a little odd), though the third course of sole was perfectly good. Better still was the triangle ravioli stuffed with artichokes which came out second. After these three courses, a palate cleansing green apple sorbet was served, before moving on to the lamb chops, tender, breaded and nicely-cooked. This was followed by a fairly substantial pre-dessert leading into the main dessert of a lovely poached pear tart with cinnamon ice cream of which our waiter was keen to let us know he was a big fan. Once again, the dessert courses were among the strongest. Ewan's verdict: I'd happily return and would bring more friends. The space would suit large groups if booked in advance (there's an upstairs area seating 25, as well as 65 downstairs). It would also be a good upmarket choice for a family treat. Last visited by Ewan and friend, April 2010. Last edited 2016-09-19 10:55:48 (version 10; diff). List all versions. Page last edited 2016-09-19 10:55:48 (version 10).